for steam and hot water service. 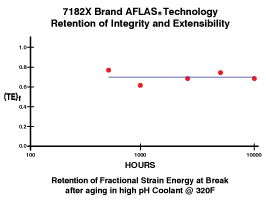 For high temperature steam, 7182 brand formulated AFLAS is the best-in-class sealing elastomer. A standard EPDM is the wrong choice for Steam. Steam and hot water service seals, gaskets, and o-rings have traditionally been made of EPDM. However, at temperatures exceeding 100C, EPDM seals quickly fail (see graph at right). 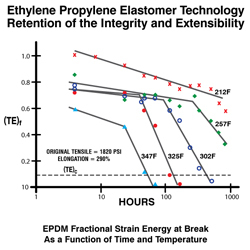 Auda and Hazleton of Exxon Chemicals Co., Elastomers Technology Division (an historic supplier of EPDM elastomer) published a study entitled "Ethylene Propylene Elastomer Technology for Improved High Temperature Serviceability" regarding the life expectancy of EPDM in hot applications. In dry heat temperatures exceeding 100C (212F), their study demonstrated a sudden and dramatic loss of integrity (retained tensile) and extensibility (retained elongation). The failure mechanism is oxidation. However, a Y-267 type EP is an exception to this rule. In HTHP steam where oxygen is absent, a Y-267 EP such as our compound 7204 performs exceptionally well. FKM is the wrong choice for steam. In the 1970’s, Seals Eastern evaluated the aging of a high fluorine content, low VF2 containing grade of FKM class fluoroelastomer in steam. 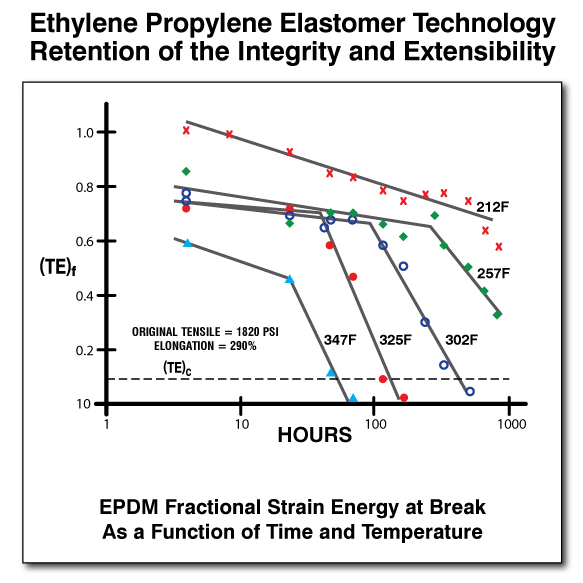 Temperatures and time frames exceeding the capability of EPDM were studied. Multiple AS568-214 o-rings of the fluorelastomer were aged in a time sequence up to 12,000-hours in 175C (347F) continuous steam. The saturated steam / hot water was a controlled pH of 7.0-7.5. Usually, a slightly basic pH is maintained to prevent corrosion in all such steam systems. The effects of steam on an FKM elastomer are depicted below. The failure mechanism is dehydrohalogenation despite the low level of VF2 in the elastomer. 7182 brand formulated AFLAS is the best elastomer available for steam service. There is no tendency of this FEPM class rubber to oxidize like a standard EPDM or dehydrohalogenate like a VF2 containing fluoroelastomer (FKM). We offer three compounds that have proven to be best-in-class over the past three decades. 7182D 80 Formulated AFLAS ® for Steam, Hydrocarbons, Acids, and Bases and other chemical families. 7182X 80 Formulated AFLAS ® for Steam, Hydrocarbons, Acids, and Bases and other chemical families. Ultra-low compression set. 7182B 90 Formulated AFLAS ® for Steam, Hydrocarbons, Acids, and Bases and other chemical families. Resists extrusion. 7204 90 Y-267 type EP for geothermal steam and HTHP steam service.